Talk Nerdy To Me: Over Your Minutes? Sadly, my largest cell phone bill was $999. I've called Verizon so many times about going over my minutes that they actually gave me my own dedicated line representative. No joke. Its a constant battle. I signed up for overage text alerts and I never have gotten one. And yes, I'm fully aware I can use #MIN to see my minutes balance, I just don't remember. It would probably make the most sense to just get the highest plan but its so strange how erratic minute usage month to month can be. 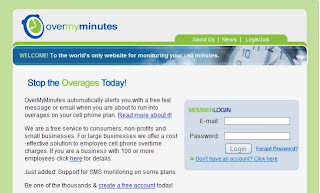 With that said, I like the idea of OverMyMinutes.com. Put in your email address and they will let you know if you go over. Its a one time shot. This is also a great way to monitor family plans. Hey I just saw your segment on CNN and I had to laugh about the Justin Beeber [sic] derailment. I'm with you on that one. Nice site too. Definitely the lair of a fellow geek. Thanks for recommending the site! Haha (Bieber segment) Isnt Don hilarious?! Thanks for reading Jerry- stay tuned! Hello and welcome. Insert smiley emoti. Hi! I'm Katie Linendoll and I am a sports-tech contributor to ESPN, ESPN.com and ESPN The Magazine. I also am a regular tech contributor on the Today Show and I host a show on Spike TV. I have a degree in IT new media from Rochester Institute of Technology. I am blessed with the ultimate dream jobs. Whether I am jetpacking across the Pacific Ocean, discovering new telepresence robots that are changing healthcare or interviewing amazing personalities such as Jamie Foxx, John Cusack, Gabby Douglas or RG3, I'm continually exploring how everyone's lives intersect with technology. I am always on the hunt to find the latest and greatest in tech, so be sure and tune in or log on to follow my latest discoveries.